I wanted to use it since then. I don’t care much about body wash as body moisturizer. It’s just for washing after few scrubs. It doesn’t have much of moisture whatever they say. I’ve come to like the mild feeling and favor of baby’s products. So I use baby’s products pretty often. I use these for my on good but I sometimes think if it will be good for my baby later. So I check the ingredients. I would be living without it if I did’t know about it without any problem. My mom might have washed me with a soap. I chose body cleanser according to the flavor and if it makes much bubble. I don’t like flower flavor of market or common flavor. I prefer unique and luxurious flavor. Good flavor makes a good bath. I think I bought it with $26.10. I always buy products because I can’t wait them. Surprisingly, it was being marketed as a natural product, although it’s not a natural product. A natural surfactant decylglucoside was used, in fact. It contains more natural ingredient than natural ingredient…but it doesn’t make it a natural product. The case seems so cheap. But content is not a cheap one. After using about twice, I became to control the amount. When I actually tried them, I was disappointed at little bubbles. It’s not a product with much bubble. Little bubble is a common feature of natural surfactant. But it cannot be blamed for the amount of bubble in that the few bubbles stay pretty long. The bubble increases slowly, and steady. Small amount is enough for shower. I have a bad habit of using a lot of body washes… But for a baby, it’s amount is enough. People who likes ample bubbles might have complain about this. It also can be used as a shampoo but it’s not very impressing. I don’t feel like using it as a shampoo any more. Men with short and healthy hair might like it. Sodium chloride was used as a preservative instead of paraben. Once again, it’s not a natural product. But it’s a mild product for grownups. I like it pretty much. The problem is limonene which has been known as ingredient causing an allergy. It is used as a perfume, and it has a preservative effect…. OF course I don’t have any allergy. But I won’t use it on my future baby. I’m worried not only about allergy but flavor. I guess flavoring was used too much. The smell is too strong…. I don’t know why they made this strong smell. So I rub this on my eyes… it didn’t feel harsh. Well, this is the main topic but I mentioned too much about Burt’s bee. I bought it with $ 4.35 at Olive Young. I use only this one as a shower tower. The case reads shower tower. I and my mother love this company, 3M. I enjoyed using its ear plug when I was in high school. At first, I bought it only by its brand. 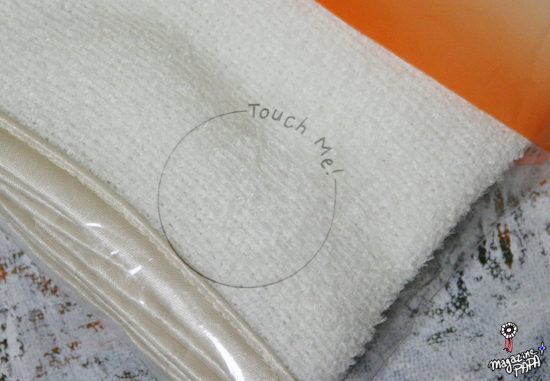 There are many Japanese product that have detailed design but I like this the most. It has a hole at the front. Well, it feels little harsh on exposed part. 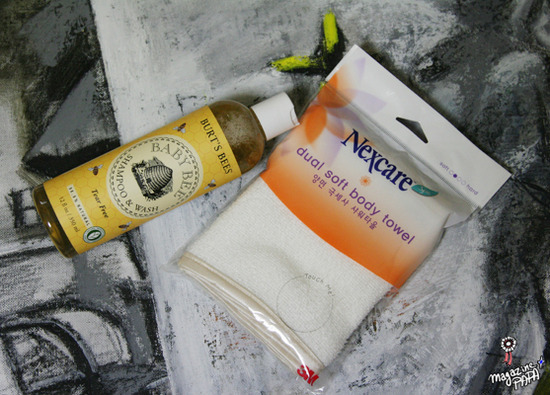 Smooth surface is for cleansing and the harsh surface is for exfoliating. Good body skin is achieved not with intensive care but steady care. Food and condition affects skin very much. Special treatment doesn’t lead to a baby skin. This one has a ring to hang with. You can use it or you can hang it in whole. I like tidy edge. The shape doesn’t change much. 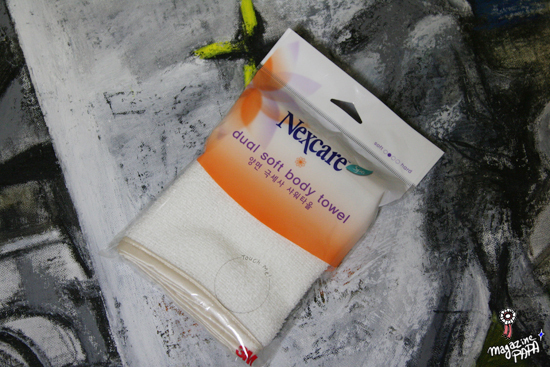 3M Nexcare deep cleansing cloth has sponge type, too. I tried sponge and a shower ball, but I came back to towel. Sponge type is also double-faced. I think it’s good for showering a baby. I didn’t try it. I think this strengthened my belief in 3M.